The Democratic People’s Republic of Korea (North Korea) is one of the world’s most secretive and reclusive states. 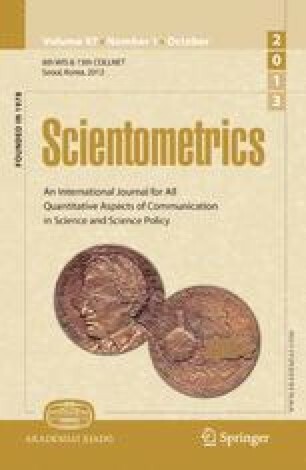 In scientometrics, even the United Nations, which compiles data from every country of the world, has been able to do little beyond counting the few scientific papers made publicly available (UNESCO 2010). The world could benefit from knowing more about North Korean science, which is quite well developed—witness all the concern about their nuclear energy and rocket launches. Here an analysis is presented of the North Korean presence in the world’s scientific literature, and of the possibilities for collaboration which offers a mechanism for positive development for their citizens and also for their neighbours. Support from NSF cooperative agreement ENG-0844639 is gratefully acknowledged. The opinions of the authors are not necessarily those of their employers or sponsors. Campbell, C. (2012). A consortium model for science engagement: Lessons from the U.S.–DPRK experience. Science & Diplomacy, 2. Retrieved July 8, 2012 from http://www.sciencediplomacy.org/article/2012/consortium-model-for-science-engagement. Choi, S. (2011). North Korean Science Center and the Affiliated Research Institutions. IT Times. Retrieved April 13, 2012 from http://www.koreaittimes.com/story/13418/north-korea%E2%80%99s-science-center-and-affiliated-research-institutions. Park, C. M. (Ed.) (2011). Proceedings of the 1st International Conference of the Pyongyang University of Science and Technology, Pyongyang. Retrieved April 13, 2012 from http://itri2.org/s/PUST.pdf. Taylor, M. A., & Manyin, M. E. (2011). Non-Governmental Organizations’ Activities in North Korea, Washington: Congressional Research Service Report R41749, March 25, 2011. Retrieved March 26, 2012 from http://www.fas.org/sgp/crs/row/R41749.pdf. Thorson, S. J. (2012). Universities and networks: Scientific engagement with North Korea. Science & Diplomacy, 2. Retrieved July 8, 2012 from http://www.sciencediplomacy.org/article/2012/universities-and-networks.